This little guy will be heading my way soon. What do you think? I think he's gorgeous. He stands out so much more than any others I saw for sale. This is the breeders picture, its the only one I have for now. He said he has blonde pastel genetics. Damn that guy is stunning! Good choice! Gorgeous! Loving that super faded head. Do you know how much he weighs? Not sure on weight yet, he's just a babe though. He said he is a great eater. Sweet! I got a little lesser from Monica (Foschi Exotic Serpents) a couple months ago. He is an eating machine. Already well over 400g and less than 6 months old! I almost forgot how fast they grow when they are little and eating well! It's funny how you forget, when everybody else is bigger. My little enchi that I recently got is an eating machine and growing like crazy. Gorgeous! 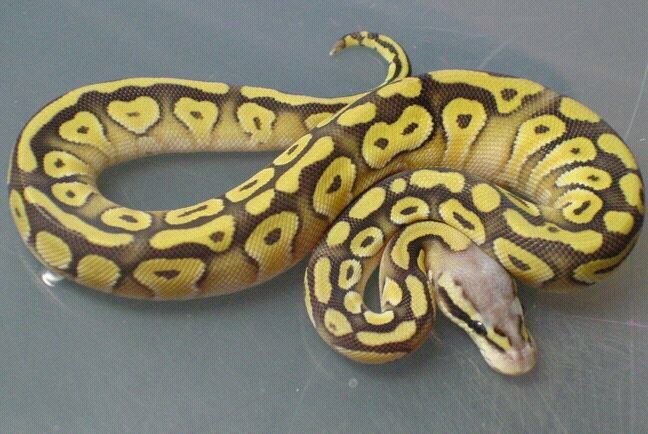 Definitely the prettiest pastel lesser I've ever seen. Absolutely stunning! Love the coloration on that little guy!